The Apple II (sometimes written as Apple ][ or Apple //) was the first popular microcomputer manufactured by Apple. Its direct ancestor was the Apple I, a limited production circuit board computer for electronics hobbyists which pioneered many features that made the Apple II a commercial success. Introduced at the West Coast Computer Faire in 1977, the Apple II was one of the very first and most successful personal computers. A number of different models were sold, and the most popular model was manufactured with relatively minor changes into the 1990s. By the end of its production in 1993, somewhere between five and six million Apple II series computers (including approximately 1.25 million Apple IIGS models) had been produced. Throughout the 1980s and much of the 1990s, the Apple II was the de facto standard computer in American education; some of them are still operational in classrooms today. 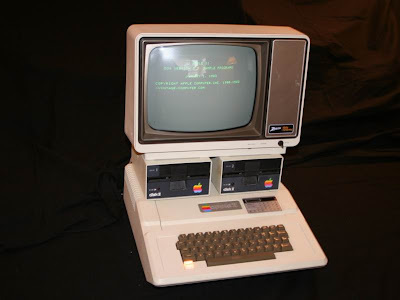 The Apple II was popular with business users as well as with families and schools, particularly after the release of the first-ever computer spreadsheet, VisiCalc, which initially ran only on the Apple II. The Apple II was originally running only the built-in BASIC interpreter contained in ROM. Apple DOS was added to support the diskette drive; the last version was “Apple DOS 3.3″. Apple DOS was superseded by ProDOS to support a hierarchical filesystem and larger storage devices. Using a diskette or hard-disk, the Apple II could also load the UCSD Pascal operating system. UCSD binaries are compatible with a large number of other computers, including the IBM-PC. Using a Z80 interface the Apple II could run the popular Wordstar and dBase software under the CP/M operating system. Apple’s Macintosh product line finally eclipsed the Apple II series in the early 1990s. Even after the introduction of the Macintosh, the Apple II had remained Apple’s primary source of revenue for years: the Apple II and its associated community of third-party developers and retailers were once a billion-dollar-a-year industry. The IIGS model was sold through to the end of 1992. The IIe model was removed from the product line on October 15, 1993, ending an era.